Lockheed Martin has demonstrated connected key components of its Aegis Ashore and Long Range Discrimination Radar (LRDR) technologies, validating the ability to greatly increase operational performance, efficiency and reliability of Aegis Ashore. Aegis Ashore is the first operational land-based version of the Aegis Combat System, a sophisticated collection of phased-array radars, fire control directors, computers and missiles. Lockheed Martin Solid State Radar (SSR) is a scalable Gallium Nitride (GaN) based radar building block, which in addition to cutting edge performance provides increased efficiency and reliability. The Department of Defense's newest Ballistic Missile Defense sensor, LRDR, will use thousands of Lockheed Martin SSR building blocks to provide enhanced target acquisition, tracking and discrimination data to the U.S. Ballistic Missile Defense System. LRDR completed its critical design review in 2017 and is on track to be operational in Alaska in 2020. Aegis Ashore is the land-based ballistic missile defense adaptation of the proven Aegis Combat System, currently fielded in Romania and soon to be fielded in Poland. The research and development demonstration proved that current and future versions of Aegis can simultaneously command tasking of the Lockheed Martin SSR and receive target tracks from the radar. The next phase of activity is to demonstrate simulated missile engagements with live tracking, scheduled for the first half of 2018. These tests build on multiple previous demonstrations in 2015 and 2016, in which Aegis software variant Baseline 9 already tracked live targets using a prototype version of Lockheed Martin SSR hardware powered by multi-purpose Fujitsu GaN from Japan. The Aegis software has evolved over time and is now compatible with multiple radars. Recently, Australia and Spain selected Aegis configurations featuring their own solid state radars. Weaving existing systems together is becoming more common to stay ahead of threats efficiently, by leveraging prior or concurrent investments in advanced technology. Lockheed Martin SSR, including very robust participation from Japanese industry, is one of the configuration options available to Japan for its upcoming Aegis Ashore installations. 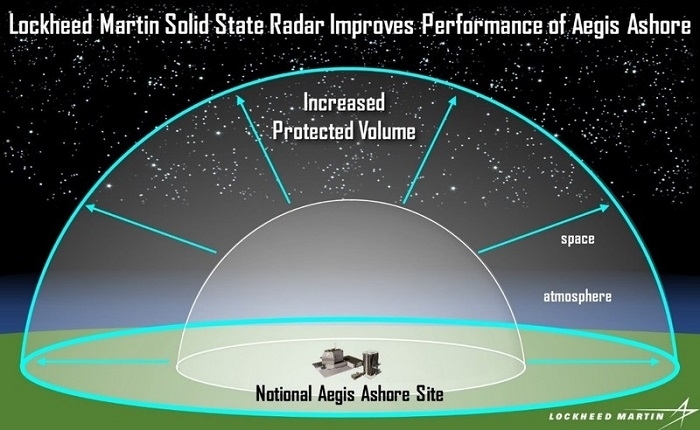 Because Lockheed Martin provides the Aegis Ashore software and SPY-1 radar, its SSR can operate in a way that uses a common Integrated Air and Missile Defense Aegis baseline with the one recently purchased by Japan's Ministry of Defense for its new destroyers. For additional information, click here.